I absolutely love seeing Grabovski play hockey. He works hard and plays hard. He takes a licking too but keeps on ticking. Definitely one of my all time favorite Leafs. I am on pins and needles every time trade season is up around the corner. I want him to stay with our buds forever. I had the wonderful opportunity to get an autograph from him vai a friend of mine. She was really kind to do me this favor. I don’t normally like asking people to get me an autograph of a certain player that he or she knows. I feel it is a violation of a friendship unless you really really know the person well. Regardless, his auto hangs on my wall!. Go Get Em Grabbo! 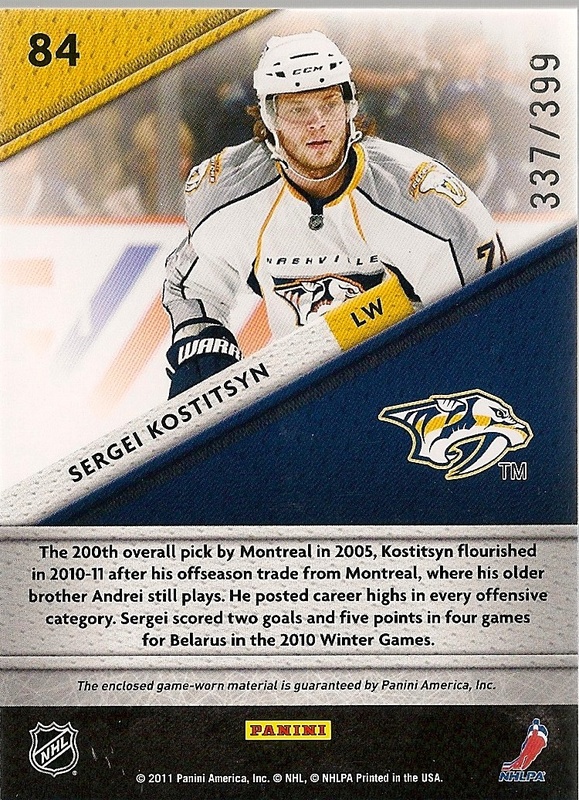 I happened to stumble upon this card in the Panini 2011-12 Panini Certified Hockey set. Notice the cards number in the set? yes 84. haha Sergei.. Grabbo OWNS you! Perfect Cardboardnerdism factoid lol. Tags: Gotta love kids with a lot of heart, Mikhail Grabovski, Nashville Predators, Sergei Kostitsyn, Toronto Maple leafs, True warrior!